For more ways to reach us, please visit our Contact page. Thank you for contacting Mobile Pro Systems. We appreciate your interest in our products, and we'll get back to you within one business day. 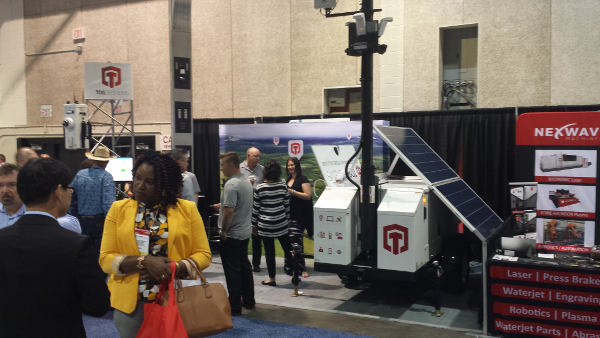 MOBILE PRO SYSTEMS supported its Canadian Authorized Dealer, TOG Systems, at the June 2017 GLOBAL PETROLEUM SHOW (GPS) at the Stampede Park in Calgary, Canada. The Global Petroleum Show is an industry leading event, where more than 50,000 energy professionals from more than 90 countries converge for three days to strengthen business relationships, network, and do business with more than 1,000 exhibitors. It provides direct access to the entire supply chain, innovative technologies, products and services within the energy sector. During this pivotal, evolutionary period for the oil and gas sector, MPS & TOG Systems very successfully highlighted the various security, communications and lighting solutions that are so desperately needed now in this resurging marketplace. Highlighted at the show were the Commander 3400 Video Surveillance Trailer, both the MPS Gate Sentry and Power Sentry platforms, and the new Smart Pole platform powered by Lumizone, (our technology partners located in Vancouver, Canada). These products, along with TOG Systems’ expertise in the areas of communication technologies and field support was extremely well received; especially by those interested in increasing safety and security at remote gas and oil pump stations, electrical sub stations, construction and pipelines as well as remote boarding and housing areas. Construction Theft is on the Rise…Are You Prepared?